How to solve these errors. You aren't using the inputs at all. You're constantly resetting theta to zero at the start of the script, so if you did happen to make the inputs time-varying, I don't think the time-varying output would be what you want because you're not progressing through time. Your script would run a complete simulation at every call. Imagine plotting this from a Matlab script - plot(time,theta) - again, there's no time dependence here. You just have one value, theta, that describes the joint angles required to achieve the desired end effector position. Your plot would be a horizontal line. I would imagine this might be contributing to the trouble you're having implementing the fix you were given. Further, this question doesn't have anything to do with SimMechanics. What you're trying to use is not the Robotics System Toolbox, which is a Mathworks product, but an outdated Robotics Toolbox. The toolbox you're trying to use was tested against a 6 year old version of Matlab. It doesn't look like there have been any meaningful updates in about two years, either. 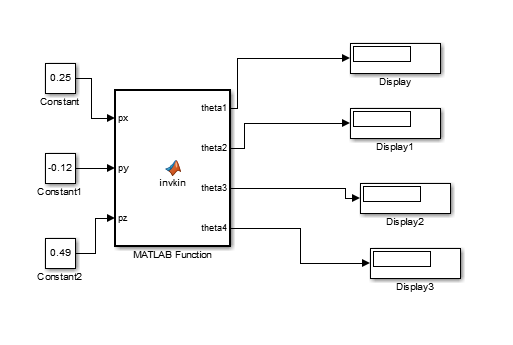 In Simulink the Matlab embedded function block supports only a subset of the available commands in Matlab. If you want to use external functions, you have to declare these using coder.extrinsic(). If the problem is with nested functions and not with declaring the external function, you could try to de-nest the function, by simply deleting the 'value' function from the file it is defined in and create a new, separate file for the function on the same path. Please keep in mind that this is a workaround, not really a fix. Not the answer you're looking for? Browse other questions tagged robotic-arm matlab simulation or ask your own question. How do I compute the inverse kinematics given a desired transformation matrix?